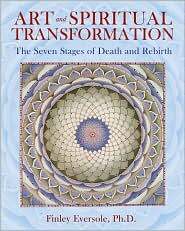 Written by Author: Finley Eversole, Ph.D.
Finley Eversole’s book Art and Spiritual Transformation is a reprint of his doctoral thesis, and it reads like one. The manuscript is thick and not selected necessarily for the joy of reading. In fact, this particular book signifies one of my personal dilemmas: at what point is a book too academic? And when academics actually burden the core concepts of the book, wouldn’t it be wiser to take a lighter hand, use lighter language and risk edifying by allowing the reader to understand what you’re saying? The blame for this does not rest on authors of such work, but on people who demand academics with no idea of what reading academic texts is actually like. Eversole delivers this answer to those academic demands fulfilling every quibble about citation and sourcing ever heard. I know I’m supposed to praise it, but mostly I want to bury it. At 365 pages, this trade paperback with color prints at the center is impressive. I imagine a few people leave this lovely work out on their coffee table because it “really ties the room together.” The bibliography goes so long some academic librarians will want to take it home to meet their mothers. This book, on first sight, impresses. But when it’s time to forge the pages, the experience of reading it resembles flying coach for ten hours: uncomfortable and overcrowded. Its content covers Campbell’s Hero’s Journey through the eyes and philosophies of 20th century artists both living and dead. Just like my old academic papers from university, the pages have quotes stuffed neatly into the dialectic expanding word count while soundly demonstrating research. Said quotes also have a desired effect on thesis committees: they lighten the burden of having to write yet more straight from your own brain, thus saving the writer from the risk of exposing an original idea at the university level before you’re approved for thoughts as radical as your own. I don’t demand originality in works like this; no idea is truly original and it’s evident throughout the text that Eversole believes in what he’s writing. But I refuse to accept attempts at integrating nihilism and Nietzche with the hero’s journey: while perhaps someone on the original thesis committee was an existentialism fan, trying to conflate it with mythology and mysticism completely ignores the point of the nihilist (should there be one) while stretching the patience of even the most Buddha-like mystic. The insertion of the topics feels forced because they don’t fit. If you want to talk about finding art and taking up the hero’s journey, look for artists and philosophers who did not in any way emulate Eeyore from Winnie the Pooh. The saving grace of this book is its final chapter: The Spiritual Foundations of Creative Life gives a hyper intellectual explanation of creative process and how in some ways it links to occult and esoteric practices. While not overtly useful, a determined innovator can take the passages about the law of Invocation and Evocation and apply it to real creative practice. Also, this chapter has charts that display the seven levels of reality/the astral – information sometimes missing from occult books where it might help the most. Ultimately Joseph Campbell’s ideas are much like quotes from the Bible: you can apply them to nearly anything, and sometimes only have to twist it a little to make it fit. That’s not quite what I see happening here: the ideas don’t quite fit, making a challenging read a tedious one. I could only recommend this to a college student asking about paganism from a nihilist point of view, mostly as a way to avoid talking to the kid ever again.